Ransford & Son (active 1869-1876), Music sellers and publishers. Artist associated with 1 portrait. Michael Watson (1840-1889), Lithographer. Artist associated with 1 portrait. Ludwig van Beethoven (1770-1827), Composer. Sitter in 3 portraits. George Frideric Handel (1685-1759), Composer. Sitter associated with 36 portraits. Joseph Haydn (1732-1809), Composer. Sitter in 4 portraits. Felix Mendelssohn-Bartholdy (1809-1847), Composer. Sitter in 2 portraits. (Johann Chrysostom) Wolfgang Amadeus Mozart (1756-1791), Composer. Sitter in 2 portraits. Karl Maria Friedrich Ernst von Weber (1786-1826), Composer. Sitter in 2 portraits. 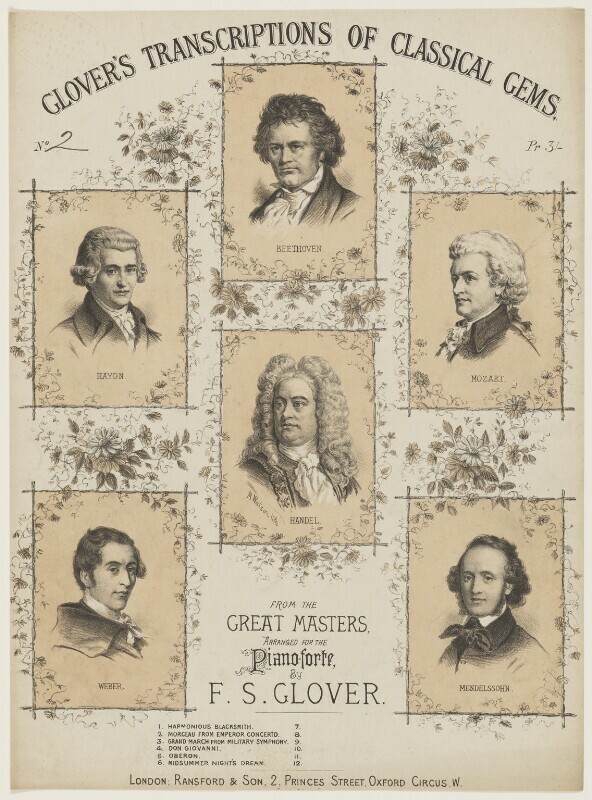 Sheet music cover for 'Glover's transcriptions of classical gems' arranged by F.S. Glover. Gladstone introduces the Irish Church Disestablishment Act, which disestablishes the Church of Ireland, disassociating it from the state and repealing the paying of tithes to the Anglican Church of Ireland. Girton College is founded in Cambridge by Barbara Bodichon and Emily Davies, the first residential college for women in England; women were granted full membership to the University in 1948. Russian chemist Dmitri Mendeleev invents the periodic table of elements, which arranges elements within a group in order of their atomic mass. The British scientist Mary Somerville publishes her last book On Molecular and Microscopic Science. Claude Monet and Pierre-Auguste Renoir paint together in the open air at La Grenouillère, developing the Impressionist style. The Suez canal opens, linking the Red Sea and the Gulf of Suez with the Mediterranean Sea, and transforming trade routes between Europe and Asia as merchants no longer had to circumvent Africa. The canal was largely in British and French control until Egyptian nationalisation in 1956, which sparked off the international Suez crisis. Serialisation of Leo Tolstoy's epic novel of Russian society during the Napoleonic wars, War and Peace finishes.